The Progress-Focused Approach: What is nothing? Apparently a lot can be said about nothing... but.. the problem is that from a certain point forward you look at the text and, even if you recognize some of the words, the language used drifts into something unknown. I just look at the wikipedia articles for Vacuum and Zero-point field, QCD vacuum... etc... well... it they are very good at maybe giving headaches. This is seen not only in physics but in spirituality too. When you get to certain concepts, they are so simple, so easy for the person knowing about the subject... yet... very difficult to grasp for the ordinary man. There is nothing as complex as simplicity. The first point one could make is that knowing what nothing is all about is completely unimportant. Life will not become any better by knowing or understanding nothing. But asking the question seems to be very human. So maybe nothing says more about humans, than anything else. But maybe it is the fact that we ask the question about nothing that says the most about ourselves. And in the end: nothing is necessary. You can not build or create anything in a place where already something exists. Matter is not like knowledge, which you can create from nothing or which you can replace with new knowledge of which can be changed with new knowledge. Um, on this topic, I got nothin. The closest I can come to contemplating this concept of nothing is to think about what was the universe like before the big bang. It's dizzying to think about. You're brave for tackling a book about nothing. I hope you'll update us once you've finished the book. Thanks Peter, Desomderdelen and Sandy. A few more thoughts on the topic of nothing. Is it important at all to understand what nothing is? Maybe not. So far, the question has not helped me in any practical sense, that is true (but this may be due to the fact that I don't know the answer). But The interesting thing about the question is that it prompted another question for me which is: when doing science, when and where do we exactly stop trying to understand nature? Anyway, have you noticed how funny and paradoxical these sentences on knowledge about nothing turn out? "Once I understand nothing, I will understand a lot more! ", "It would be wonderful if we'd understand nothing." 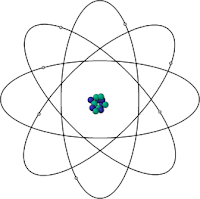 One thing that puzzled me back then, thinking about the structure of atoms, is that the largest part of atoms, and of matter is taken up by nothing. Electrons, protons and neutrons are tiny. So, everything consists mainly of nothing.